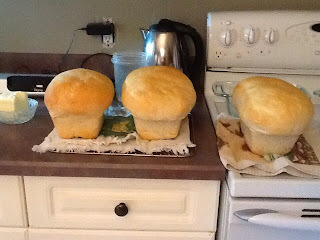 Crescent Moon Collective: Tuesday is bread day! I've been making my own bread for quite a while. Store bought just doesn't cut it. I don't want my bread filled with preservatives.Three loaves a week works around here and I thought I would share the recipe. It's as old as the hills! Mix in order, sprinkling the yeast in with the first few cups of flour. I use the kitchenaid mixer and just put all the ingredients in the bowl and let the hook do the work. Once its mixed, knead it and put it in a greased bowl. I put the bowl in the oven with the light on, covered with a tea towel. Let it rise until it doubles. Punch it down, kneading out the air bubbles. Put back in the bowl, cover with the tea towel, and back into the oven. Allow it to double again. Once it doubles again, punch down, knead and replace to the oven. The next time it doubles, knead and divide into three loaves and put in greased bread pans. Punch down each loaf in the greased pans, turn over and let rise. Remove the risen loaves from the oven and preheat the oven to 350 degrees. Bake for 30 minutes. Remove from pans, butter the tops and let cool. ohhh those look good. I am sure I can even smell them from here.